I think most healthy food suffers from lack of flavor. Yes, you can roast your potato wedges to simulate fries, but you’ll probably still reach for some ketchup to have something to dunk it in. What if your kids could make their own sauce that has the creaminess of ranch without all of the fat? The Greeks have this sauce and it’s a wonderful alternative to ketchup. 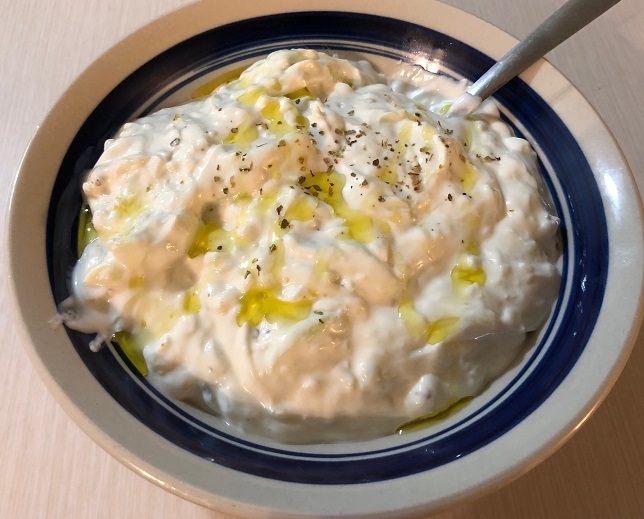 We teach kids Mediterranean curriculum and kids are surprised by this sauce because it looks like something they know (Ranch, which is loaded with heavy cream, sour cream and mayo) but has a creamy, slightly tangy flavor profile. Grate the entire cucumber, then use your hands to squeeze as much of the water out of it as possible, then remove to a large bowl. Add the Greek yogurt and chopped garlic to the bowl. Add 3 Tbs olive oil, 2 Tbs fresh lemon juice or vinegar, oregano, 1.5 tsp salt, pinch of black pepper and stir. (Add dill if you’d like) Taste and see if it needs a bit more salt or a bit more of tang from the vinegar. Cover with plastic wrap and refrigerate for minimum 1 hour, ideally 3-4 hours or overnight. Taste and adjust the seasoning as it will have a new, creamy essence. Important Note on Greek Yogurt: Greek yogurt in the US comes in a lot of different styles and flavors. Some have more fat than others, and other have more sugar. Do NOT get a Greek yogurt that has any flavors (i.e. Vanilla) or is an unusual brand. Stick with FAGE, which is popular in Greece, or Chobani. The question about whether to go whole milk or skim/low-fat is up to you. I’ve made tzatziki with both and prefer a full-fat yogurt. 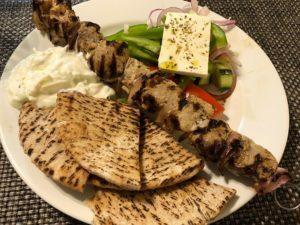 The Greek chefs I spoke to that make tzatziki also use whole milk. You can make it with skim milk but it may need extra help to give it a desirable taste. Add a bit of olive oil, salt or lemon/vinegar as needed. Also follow the notes below. Note for The Kid-Friendly Version: Depending on the type of Greek yogurt, it might have too much of a tart flavor. If after you’ve made your tzatziki it’s TOO tart-like add 1 tsp of sugar, stir, taste and add a bit more if needed. Remember you’re using 2 cups of yogurt, so adding about 1-2 tsp of sugar is not much and will make the whole sauce taste bitter. Tzatziki is delicious with pork soulvaki (skewers), pita bread and a Greek salad.